Darren Naish wasted a lot of my time in the last two weeks, not that it was his fault. It was fun, actually. I was looking for a distraction, and I found it in his discussion of protobats. I didn’t (and don’t) believe the model he put up there, because it doesn’t make sense. At one end, there’s a nice, tree shrewish gliding animal, and at the other end is a bat, and in the middle is a flying insectivore with big hands. What happens in between? • It goes from rear-wheel drive to front-wheel drive, which is another way of saying that the antebat (bat ancestor with no aerial modifications) has the strong hindlimbs, flexible spine, and barely rotating shoulders common in mammalian quadrupeds, while bats have enormously strong and flexible shoulders, highly reduced pelvises, and hip joints that have rotated substantially, such that their knees tend to point outwards or even backwards. The protobat (something with a patagium and presumably some aerial ability) would be a mosaic in the middle. • It goes from a rigid glider to a powered flapper. I think I saw this problem first mentioned in Grzimek’s Encyclopedia, but I’m probably wrong, and it was a decades ago. The problem that someone pointed out is that a flapping flying squirrel doesn’t glide farther, it falls out of the sky, for two different reasons. –First, there’s the question of how a flailing patagium generates lift, especially when the trailing edge is being held semi-rigid by the hind legs. It will lose lift because the aerofoil is disrupted, and it is unlikely that the forelimb movement will get air under the patagium any faster. –Second, gliders tend to have fairly long bodies, with the center of mass in the center. Increasing strength in the arms pulls the center of mass forwards. You can replicate the problem by making a wide-winged paper airplane and adding paperclip or staple weights, and seeing what this does to the plane’s flight characteristics. Worst, the hypothetical protobat does makes all these structural changes while needing to glide. If I was feeling snarky, I’d point out that this is akin to evolving a helicopter from a glider, and it’s certainly evolving an ornithopter from a glider. The real problem with these ideas is that the intermediate stages look less able than their predecessors. This seems to violate evolutionary theory, which posits that evolution proceeds blindly, favoring traits that increase (or at least maintain) fitness, traits which will spread through a polymorphic population and eventually take over, possibly through isolation. A flapping, mid-weighted flying tree shrew seems to embody the worst of both worlds, since it doesn’t have the advantages of flight, nor does it have the simple stability of a glider. 1. There are no extant protobats. This supports two ideas. It implies that evolutionary theory is correct. If bats were at a selective disadvantage, there would be lots of non-flying chiropterans around. It probably also implies that protobats had an advantage over antebats as well. 2. We’re pretty sure that bats evolved in the Palaeocene, simply because their fossils show up in the early Eocene. That tells us a bit about the environment in which they evolved. For simplicity, I’m going to say that it looks something like modern Papua New Guinea (there’s a bit of research behind this statement, but it’s not germane. Take it on faith for now). It’s probably instinctive for biologists to think of gliders as the antecedents to powered flyers, but this may be problematic. There are quite a few extant gliders, for example, but how many of them launch with their front limbs? The only group I could find are the freshwater hatchetfish, and as noted in the comments on Naish’s blog, they are jumpers, not properly gliders. However, all flying animals use their forward limbs to propel themselves through the air. To me, this suggests that we may mislead ourselves by assuming that the ancestor of a flying animal looked like a flying squirrel. What other way is there? Let’s look at bats and bat development. I don’t for a second buy that bat ontogeny exactly recapitulates bat phylogeny, for the simple reason that it doesn’t in humans. Enormous wings need to develop first and fastest, just to function. That said, the developing bat fetus does suggest a few possibilities. First, their wings are very different than the hind feet. This seems obvious, but one possibility is that protobats looked like the so-called flying frog ( such as Rhacophorus nigropalmatus) where all for feet are enlarged. There’s no evidence for this in bats: their hind feet are much more similar among species than their wings are, and I assume that this has always been true. Antebat hind feet probably look like those of extant bats. Perhaps their front feet looked like those hindfeet as well. Second, it appears that the bat’s pelvis is splayed even in the embryo. People seem to assume that the bat pelvis splayed to accommodate the growing wing, but there’s no particular reason to think that. Third, modern bats have a massive amount of morphological diversity in their heads, but that has as much to do with echolocation as anything else. 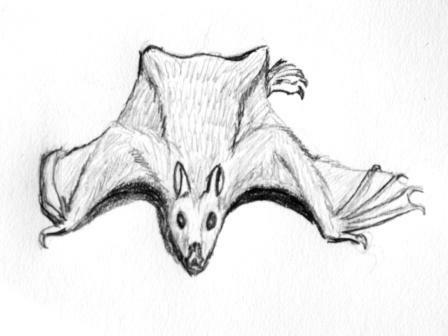 Still, I think it’s reasonable to assume that antebats had a reasonable amount of head diversity, to the extent that different species or morphs may have consumed arthropods, nectar, fruits, and tree gums, much as modern bats do. Yes, that’s the dubious spider-shrew, and I’ll be amazed if they ever find it. The name describes both how I think it moved and the niche it held. The images above are my crude sketches of the critter. In constructing this antebat, I started backwards. What if, rather than the patagium coming first, the hip and shoulder alterations came first? Are there any animals that have powerful front shoulders and outward pointing knees, and second, are there any advantages to this configuration? Bats have these characteristics, (as do spiders and other non-mammalian animals). Many bats are quite good on vertical surfaces, even ceilings, and they cling well. Something like a vampire (Desmodus rotundus) moves well on the ground, on walls, even on rough roofs, and can launch itself into the air using the power of its forelimbs. The advantage of those backwards pointing hind feet is that they make excellent grappling hooks. 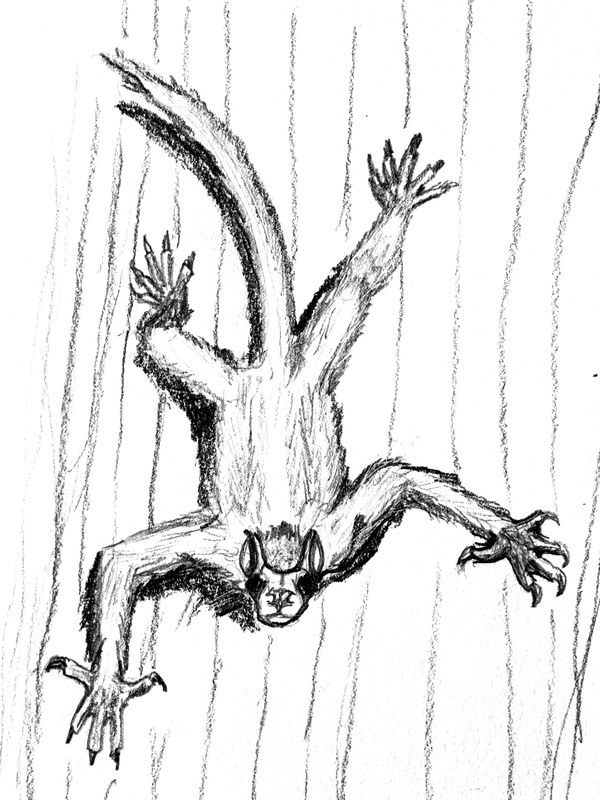 An antebat with strong forelimbs and backwards pointed hindlimbs would be quite agile on a variety of surfaces, whether face up, face down, or sideways. However, it gives up some speed for this maneuverability (since it gives up that characteristic mammalian gait, the gallop), so the antebat would be limited to areas like tree-trunks (on the bark or inside a hollow tree), on thin branches (especially the underside of branches) and in caves—in other words, places we find bats now. From nose to tail: the spider-shrew’s head is based on a primitive fruitbat, with a smaller braincase but still well-developed eyes. The forelimbs are well developed, but there is little enlargement of the hand. The hindlimbs are splayed, and the spider shrew overall has a semi-sprawling posture. However, it can move effectively on the ground. The tail is thin and fairly stiff. Its primary function is to act as a support when the antebat is climbing. This “hypothetical dropper” was inspired by a fruitbat photo I found on Flickr. In this case, the patagium is developed, but I see no reason why it should have a hairless patagium. Here I suggest that antebats became protobats by developing long-distance jumping and falling as an efficient defense and as a way of covering long distances. This lifestyle change hinged on developing more powerful forelimbs and better vision (echolocation evolved after bats flew, according to the fossils). While yes, I’m suggesting a gliding intermediate, in this case, I think it’s likely that protobats powered their takeoff jumps with their forelimbs, not their hindlimbs. They saved on weight by making their bodies more compact and their limbs longer, as seen in modern bats. Probably finger elongation started initially as a way of increasing patagium area (as here, with the dropper), and protobats early on developed the folded wrist we see in modern bats, effectively climbing on the backs of their wrists, with their thumb claws providing the support of the five claws of the antebats. It’s also possible that the uropatagium developed with the arm membrane, giving a “three-winged” form to glide with before ultimately developing into the bats we know today. The advantage of the three-winged form is that there is a separate wing structure that, combined with the highly developed shoulders the protobat inherited from its antebat ancestors, can lead to ultimately to powered flight. The more Instillator develops its forelimbs, the better it does. Diet wise, I suggest no change from antebats to protobats. The protobats ate the same food as their ancestors did and their descendents will. As with the spider shrew, this satisfies both limiting criteria.